The potential is there, but when will this aerospace giant deliver? Shares of General Dynamics Corporation (NYSE:GD) had their worst day in about a decade after the company reported third-quarter results that were underwhelming at best. The 8% one-day drop feels like an overreaction, but the company certainly has a lot to prove in the quarters to come if it is to regain the confidence of investors. General Dynamics posted earnings of $2.89 per share, ahead of the Street's $2.76-per-share estimate, but that beat was thanks to a 14-cent contribution from a lower tax rate. Beneath the surface there wasn't much to get excited about. Third-quarter operating profit fell by 5.6% in marine systems, 2.4% in combat systems, and 1.3% in aerospace, on revenue that thanks to an acquisition rose 20% to $9.1 billion but fell short of the $9.4 billion estimate. The company also reported an operating margin of 12.5%, down from 14% a year prior. All eyes are on a recovery at Gulfstream, maker of the G650 and other business jets. Image source: General Dynamics. 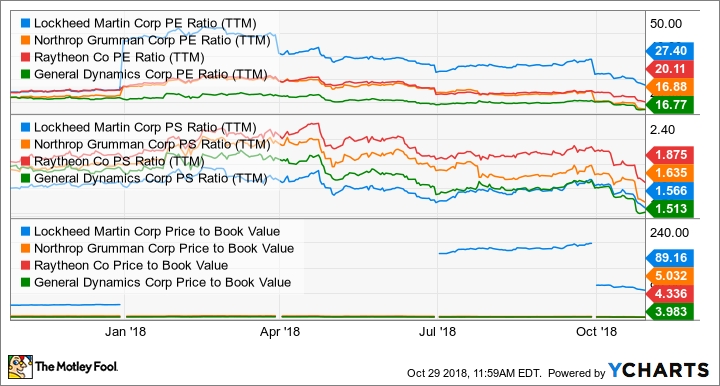 General Dynamics has long been the valuation laggard among large defense primes, and the primary concern that has weighed on the stock during the last few years was among the culprits this quarter as well. Here's a closer look at what ails the company, and the outlook for improvement in the quarters to come. Aerospace's Gulfstream unit more than anything else has been responsible for General Dynamics' relative underperformance compared to other defense giants, with the business jet market never fully recovering from the 2008-2009 recession. There are signs that the industry as a whole, and Gulfstream with it, is poised for a recovery, but troubles remain. The issue plaguing Gulfstream this quarter related to the July bankruptcy of supplier NORDAM Group, maker of the nacelles for the engines on the upcoming G500 and G600. Gulfstream in September acquired the manufacturing line to try to ensure the production line can continue, but the transition has caused delays. Gulfstream plans to deliver up to 10 G500s in the fourth quarter using nacelles produced before the July bankruptcy filing, but General Dynamics said it might take until well into the first quarter of 2019 to get production caught up. This issue has made it difficult for Gulfstream to provide firm delivery dates for new planes, and appears to have handed a sales advantage to rivals Textron and Bombardier. The company's aerospace book-to-bill for the quarter was 0.76 times, compared to 1.2 times for its rivals. The good news is that Gulfstream is selling into an improving market, and GD chairman and CEO Phebe Novakovic said on a conference call with analysts that as clarity around delivery time has improved, so too has interest. The G500 early deliveries will be lower margin compared to the G600 because the 500s carried a disproportionate share of the test program, but Gulfstream sales growth should accelerate in 2019, and improved profitability should follow. The military side of GD was also focused on transitions. Though margins were down in the quarter in various sectors, some of that was the result of early-stage spending for programs that should generate predictable profits in future years. Marine systems in particular has a number of early-stage programs, including the DDG guided missile destroyer and the Columbia-class nuclear missile submarine that weighed on third-quarter results. As a rule, large-ticket defense items tend to improve in profitability with maturity. In the case of General Dynamics, third-quarter engineering work on the Columbia and other new business swamped production of very mature programs, including the Virginia-class submarine. On the call Novakovic said that margins are not going to improve overnight, but she is hopeful. The way I think about these margins is, look, we've got quarter variability, but the trend is there and there's a lot of moving parts as we move into Colombia, because the decrease in the cost plus decrease in the engineering work which carries lower margins and the advent of construction, that offers some opportunities. So I think that at the moment, it's too soon to tell, but there is potential to get better. Elsewhere General Dynamics' massive land vehicle operation could be among the beneficiaries of a plan to refocus army spending away from fighting insurgencies and toward countering a major-power adversary like China or Russia. The army as part of that shift seems likely to deemphasize the nearly 40-year-old Bradley Fighting Vehicle, made by BAE Systems, in favor of a forthcoming next-generation combat vehicle. General Dynamics' Griffin design is seen as a favorite for the NGCV, competing against BAE and Raytheon Company, and GD and BAE are also competing for a separate light tank award. While some mature General Dynamics programs could be at risk in the reshuffling, notably the mainstay Abrams tank, there seems to be more new business potential than old program risk. The company's IT business grew by 116% year over year thanks largely to its $9.7 billion acquisition of CSRA, but generated 7.1% organic growth even excluding the acquisition. Operating profit for the business was up 55% thanks to the combination, but margins, at 6.8%, were down from 9.5% a year ago due to merger costs. Excluding acquisition-related amortization, the business generated a margin of 9.6%. Overall General Dynamics reported a total backlog of $69.53 billion, up more than $3.24 billion from the second quarter and up $5.6 billion from a year prior. Will next time be different? It wasn't a stellar quarter for General Dynamics, and the company's businesses aren't currently performing to the levels of rivals including Lockheed Martin. But General Dynamics shares, especially after that post-earnings decline, also trade at lower multiples than shares of Lockheed and other defense contractors. That discount isn't an opportunity unless General Dynamics can start producing better results, but I remain optimistic about the company's prospects. The Gulfstream business, despite the NORDAM stumble, is on the mend and should generate double-digit earnings growth by 2020 if not 2019. Despite the margin pressure, defense reported a book-to-bill of 1.4 times for the quarter and is well positioned to grow, and IT as CSRA is fully integrated has the scale to compete for larger slices of government business. Admittedly, it might be a bit early to buy into General Dynamics today, especially given the potential headline risk to the sector. But for a long-term holder, betting on a recovery at GD is one of the least risky wagers I see in the industrials sector. Given time, General Dynamics can be an outperformer.